Another great new novelty hybrid with unbelievable potential for further breeding! The pod parent, Yaphon Surprise Happiness, combines all of the premier species for great color in a novelty cross, Phal. 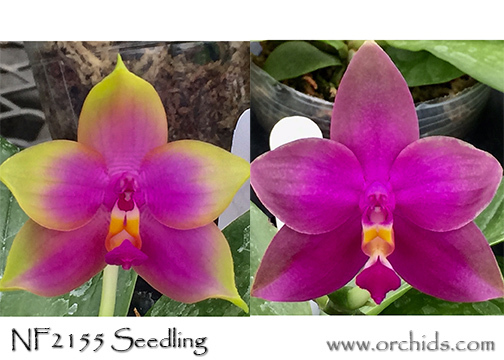 violacea, venosa, lueddemanniana and micholitzii, creating the proven breeders of its parents, Phal. Dragon Tree Eagle and Nobby’s Green Eagle. By mating it with Phal. bellina var. coerulea, it has added even more fullness to the flowers and sparked an added punch to its vivid color. Expect deliciously fragrant waxy flowers with a heavy saturation of color, their color becoming more intense when flowered under cooler and brighter conditions. The range of this new hybrid’s progeny can run from a boldly saturated central flush to some totally solid clones. A great hybrid for further breeding and Very Highly Recommended!